Margaret writes to Jessie about social and travel plans. We are having perfectly beastly weather here the last two or three days, nothing but rain, rain, rain and I suppose it has given me the Spring fever, for I can hardly hold my head up this morning from sheer ennui.Princeton it getting simply beautiful now. The trees and bushes are covered with blossoms. I won't tell you too much about it, for fear of making you home-sickI haven't heard from Caroline since I wrote, so I don't know yet exactly when I am going to York. I hope to see dear old Helen when I go, for we shall probably go up to Harrisburg, that is I am hoping we shall. We beat Pennsylvania 4 to 8 or 5 to 1 I don't know which. I heard both. Isn't that fine? We are all very much encouraged over the team. I have a full week before me, a dance to-night, a tea tomorrow, tennis and lunch with Mrs Williams Thursday, a dance on Friday and a dinner on Saturday and supper on Sunday. I see where Maggie will need the rest in the country with Caroline. Will you ask Mary W for me for goodness knows when I will have the energy to write to her, whether that Norfolk plan is all off or not. Please tell me in your next letter whether she has heard anything more from them. Tell her that I haven't heard a word from them at any time. Well dear I shall see you on the afternoon of the 24th. I looked at Mary Sawyers' letter again, and it said that she lands on the last of May or the first of June—I shall write to her and tell her when the banquet is and to come straight down from the steamer post haste. She sails on the “Caronia,” Cunard line, the twenty-first of May, from Liverpool. You all can write her steamer letters. The German play is Thursday night They are going to give “Die in.”Well dear there is in these four pages all the news that I know. Give my love to the girls and keep oceans & oceans for your dear self. 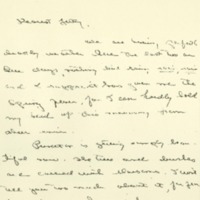 Wilson, Margaret Woodrow, 1886-1944, “Margaret Woodrow Wilson to Jessie Woodrow Wilson Sayre,” 1907 May 7, WWP17391, Jessie Wilson Sayre Correspondence, Woodrow Wilson Presidential Library & Museum, Staunton, Virginia.